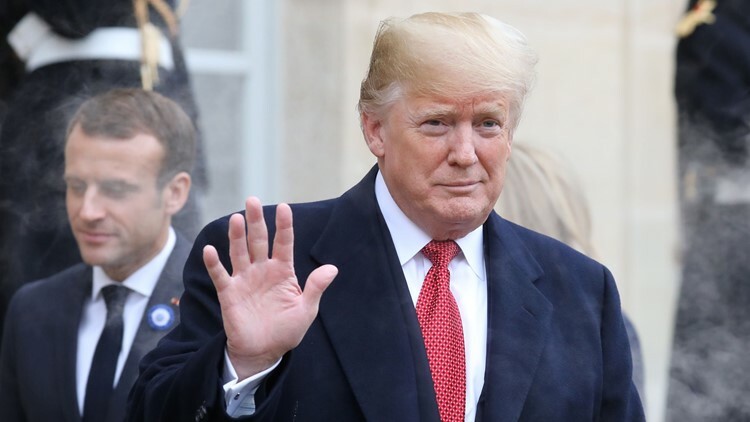 US President Donald Trump waves as he leaves the Elysee Palace in Paris on November 10, 2018 following bilateral talks with French President Emmanuel Macron. The cancellation of Saturday's visit drew criticism from those who say the president should have found a way to travel to Aisne-Marne regardless of the weather. PARIS — President Donald Trump canceled a planned visit Saturday to a cemetery for Americans killed in World War I, the White House citing bad weather that grounded his helicopter. Instead, Trump spent much of the day following a meeting and lunch with French President Emmanuel Macron at the U.S. ambassador's residence, where he was staying during events to commemorate the 100th anniversary of the end of World War I. Attending in Trump's place were the White House chief of staff, retired Marine Gen. John Kelly; the chairman of the Joint Chiefs of Staff, Marine Gen. Joe Dunford; and several members of the White House staff. The Battle of Belleau Wood was a critical conflict in the war and a pivotal encounter in Marine Corps history. The Secret Service determines when it's safe to fly Marine One, the president's helicopter. Paris was covered in clouds with drizzling rain through most of Saturday. Ben Rhodes, who was deputy national security adviser for President Barack Obama, accused Trump of "blowing off honoring American servicemen who died for us" and said the White House should have had a fallback option.